The simultaneous occurrence of primary brain tumors with differing histology is seen in 0.3% of all brain tumors. Occurrence of multiple intracranial tumors of varied origin is not uncommon but is usually observed in genetic diseases such as neurofibromatosis or tuberous sclerosis, or in the case of secondary tumors occurring as a sequelae of cranial radiotherapy. The earliest reported case of two different tumors in the same patient is by Feiring and Davidoff in 1947. Till date, the most frequently reported combination of lesions in such cases is that of a meningioma and a glioma. A 56-year old female patient presented with complaints of memory lapses since 2 months and vomiting with visual blurring for 4 days. On examination, she was disoriented and confused. Vision was 6/60 on the left side and normal on the right side. Fundus examination showed left-sided hyperemic disc with edema. Perimetry was attempted but was not possible due to her memory disorder. Rest of the neurological examination was normal. Computed tomography (CT) scan showed the presence of a left frontal lesion with patchy hemorrhages within it and sphenoid wing hyperostosis. Magnetic resonance imaging (MRI) was suggestive of an extra-axial left frontal lobe infiltrative lesion extending into the corpus callosum and right frontal lobe, causing mass effect and midline shift [Figure 1]. 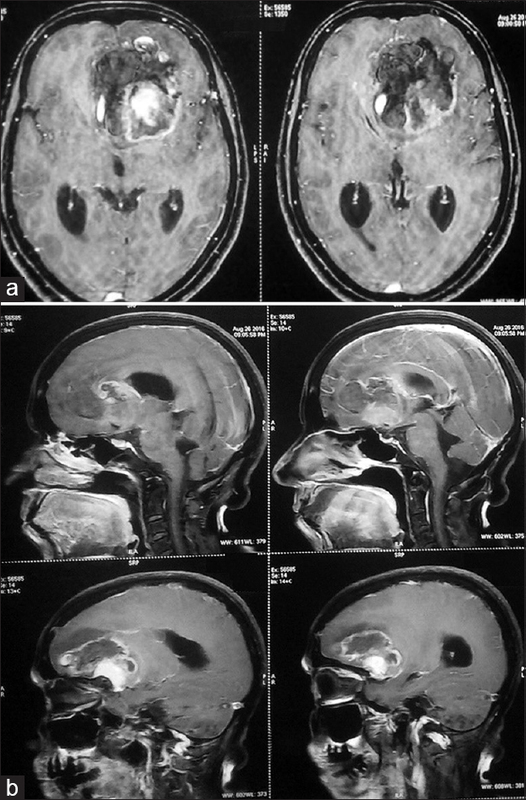 On contrast scans, a well-defined homogenously enhancing lesion in the left frontal lobe was seen, suggestive of a meningioma, along with an abutting heterogeneous lesion, which appeared to be a high-grade glioma [Figure 2]a and [Figure 2]b. Left frontotemporal craniotomy with gross total excision of the glioma and complete excision of the sphenoid wing meningioma was done. 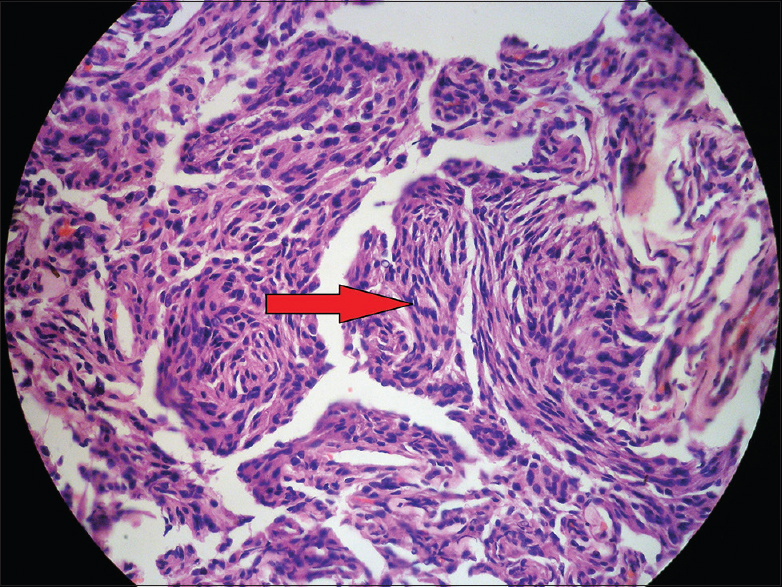 Inferiorly, the tumor was in contiguity with the meningioma. 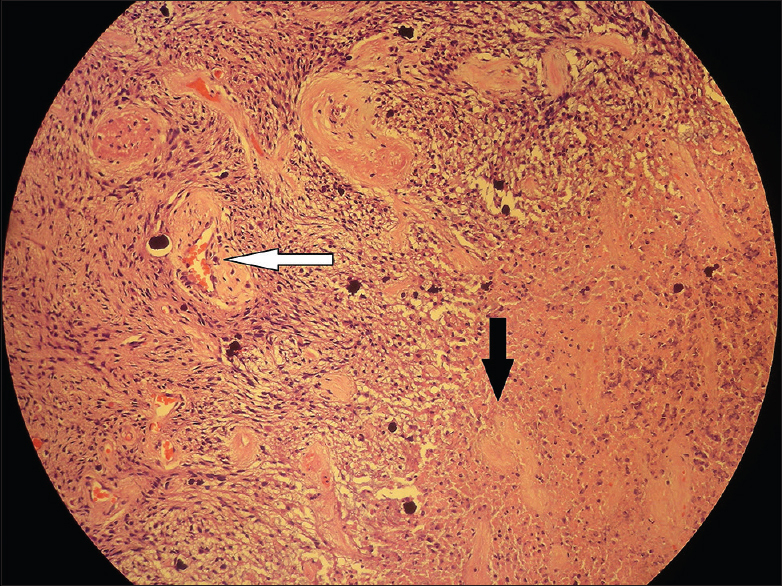 Histopathology showed two lesions: (1) Transitional meningioma of World Health Organization (WHO) grade I [Figure 3]; and, (2) glioblastoma with oligodendroglial component of WHO grade IV [Figure 4]. On immunohistochemistry analysis, meningioma had a Ki 67 score of 1–2% and glioblastoma showed P53 positive, isocitrate dehydrogenase negative, and alpha thalassemia/mental retardation syndrome X-linked (ATRX) retained status as well as a methylation-inhibited binding protein-1(MIB-1) score of 10–15%. Postoperative computed tomographic (CT) scan showed complete excision of the lesions [Figure 5]. She underwent adjuvant therapy in the form of concurrent chemotherapy (temozolamide) and cranial radiotherapy. Many theories have been hypothesized for the simultaneous occurrence of different intracranial tumors in the same patient. There is no consensus yet on their exact mechanism of origin. A few studies have attributed it to be an incidental finding. This is a prevalent belief as both meningioma and glioma are fairly common central nervous system tumors. 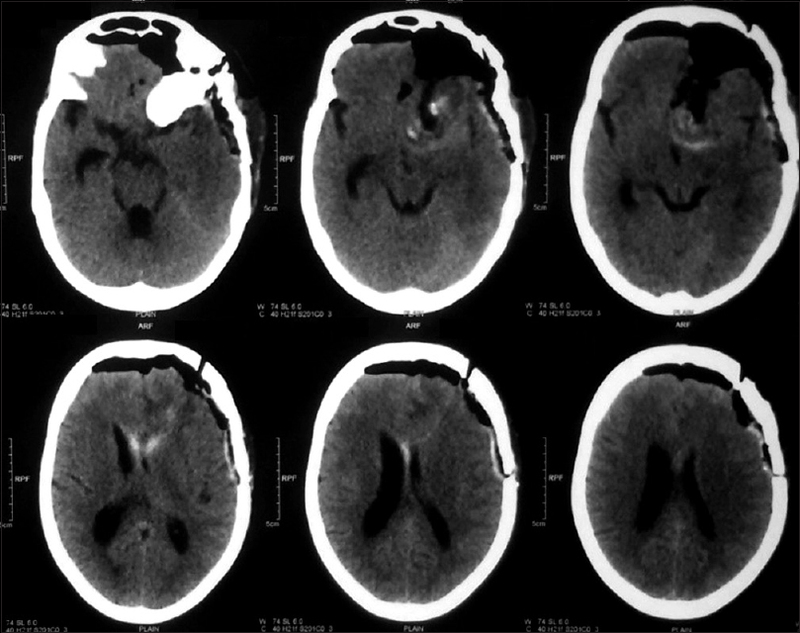 Nestler et al., described three cases where a meningioma and a glioblastoma occurred together. Specimens from the two patients were cultivated in cell culture and were examined for chromosomal aberrations by the conventional karyotyping and comparative genomic hybridization. In one patient, it was possible to compare the data. In that case, a common genetic aberration in the tumor cells was not found. Another theory suggests that the astrocytoma may develop due to neoplastic transformation of the reactive glial cells surrounding a meningioma. It may be a possibility that one tumor may act as the stimulus for local proliferation and growth of the other, inducing neoplastic transformation. However, these theories do not hold ground in explaining the inability of majority of intracranial meningiomas to transform reactive glial cells surrounding it, and also fails to explain the simultaneous occurrence of two tumors which are in opposite hemispheres or are far apart in the same hemisphere. The Wnt/β-catenin pathway which deals more with benign meningiomas because many benign meningiomas have been shown to have deletions in the adenomatous polyposis coli (APC) gene, which is a major gene of this pathway. 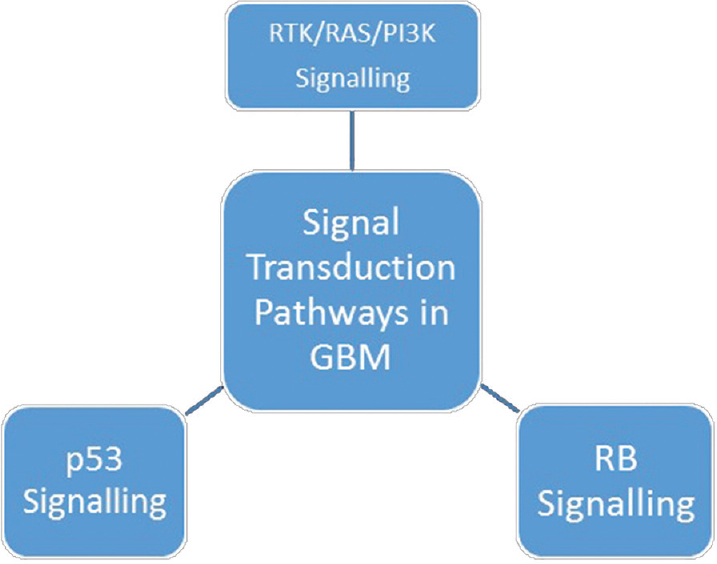 Retinoblastoma protein (RB) gene signaling altered in 78% of glioblastomas. To conclude, edema or hemorrhage away from the site of a primary well-defined lesion necessitates ruling out additional lesions. A primary glioma and meningioma adjacent to each other is a rare occurrence but a definite possibility. Immunohistochemistry is advised as it provides valuable knowledge about the genetic alterations, if present. Though there is a school of thought which attributes such cases to an incidental finding, a review of literature suggests a genetic or reactive cause for the simultaneous occurrence of the two tumors, which makes it imperative to study them in greater depth. Nomura K. Analysis of therapeutic factors related to survival rate for malignant glioma patients—report from Brain Tumor Registry in Japan, Vol. 6, 1987. Gan No Rinsho 1989;35:1219-25. Feiring EH, Davidoff LM. Two tumors, meningioma and glioblastoma multiforme, in one patient. J Neurosurg 1947;4:282-9. Strong AJ, Symon L, MacGregor BJ, O'Neill BP. Coincidental meningioma and glioma. Report of two cases. J Neurosurg 1976;45:455-8. Nestler U, Schmidinger A, Schulz C, Huegens-Penzel M, Gamerdinger UA, Koehler A, et al. Glioblastoma simultaneously present with meningioma—report of three cases. Zentralbl Neurochir 2007;68:145-50. Drlicek M, Aichholzer M, Wurm G, Bodenteich A, Fischer J. Collision tumour composed of glioblastoma and meningioma—a case report. Pathologe 2004;25:402-5. Miller R, DeCandio ML, Dixon-Mah Y, et al. Molecular targets and treatment of meningioma. J Neurol Neurosurg 2014;1 (1). pii: 1000101. Suzuki K, Momota H, Tonooka A, Noguchi H, Yamamoto K, Wanibuchi M, et al. Glioblastoma simultaneously present with adjacent meningioma: Case report and review of the literature. J Neurooncol 2010;99:147-53. Goumnerova L, Guha A. Oncogenes and growth factors in astrocytomas. In: Black PM, Schoene WC, Lampson LA, editors. Astrocytomas: Diagnosis, Management and Biology. Oxford: Blackwell; 1992. p. 211-27. Black PM, Carroll R, Glowacka D, Riley K, Dashner K. Platelet-derived growth factor expression and stimulation in human meningiomas. J Neurosurg 1994;81:388-93. J Li, W Hu, Z Zhang, D Wei. Clinical and pathological studies of meningioma-glioma mixed tumor. Surg Sci 2011;2:140-3. Shinde SV, Shenoy AS, Savant HV, Balasubramaniam SB. Coexistent intracerebral metastatic melanoma and meningioma. Neurol India 2017;65:110-2. Lusis EA, Watson MA, Chicoine MR, Lyman M, Roerig P, Perry A, et al. Integrative genomic analysis identifies NDRG2 as a candidate tumor suppressor gene frequently inactivated in clinically aggressive meningioma. Cancer Res 2005;65:7121-6.